رپبلکن Script error: No such module "Officeholder party tracking". Mierka, Gregg A. "Rhode Island's Own." MOLLUS biography. Accessed جولائی 19, 2010. Wilson, James Grant, John Fiske and Stanley L. Klos, eds. 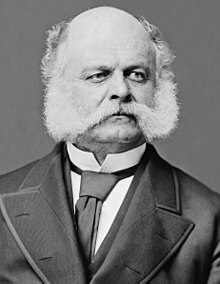 "Ambrose Burnside." In Appleton's Cyclopedia of American Biography۔ New Work: D. Appleton & Co.، 1887–1889 and 1999.